18-year-old student wearing a sheer skirt filled with flowers, a Kappa jacket, platform shoes from WEGO Harajuku, a cute Panda pouch, plush muffler, and a patent New Balance bag. Female Harajuku designer in colorful street style with resale fashion, Chinese top, and Muay Thai shorts. Prismic Prism founder in Harajuku wearing a vintage gingham dress from Kinji with a hair bow, panda purse, and Tokyo Bopper ballet shoes. 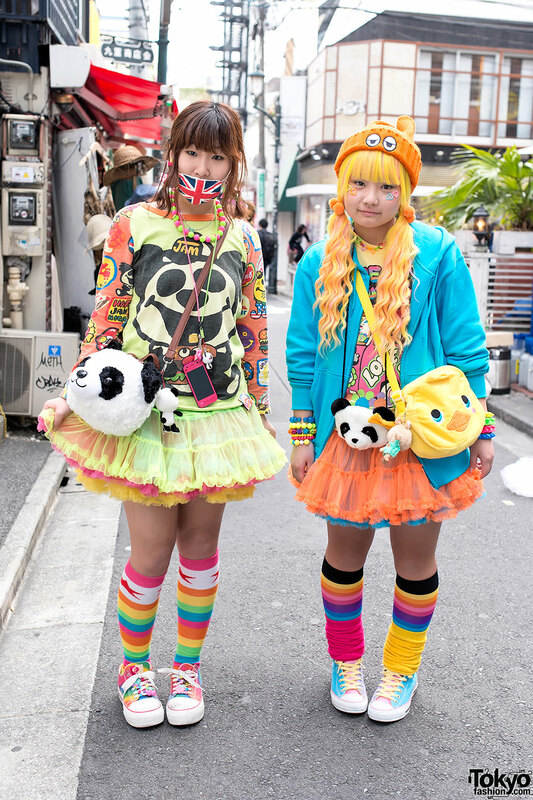 Harajuku girls wearing colorful fashion featuring tulle skirts, rainbow socks, sneakers and lots of candy accessories.